Welcome here again! Allow me to present to you this interesting post titled, Tag Questions in English: Formation, Rules and Examples. There are many Types of Questions in English and I have a post dedicated to that which you might want to check out. Tag Question is one of them. Let us look at its formation, rules, types and examples; shall we? A tag question is a short question which we add to a statement, to elicit a confirming response from the hearer. In other words, a tag question is one in which an imperative sentence or a declarative sentence is changed into a question with an interrogative tag. 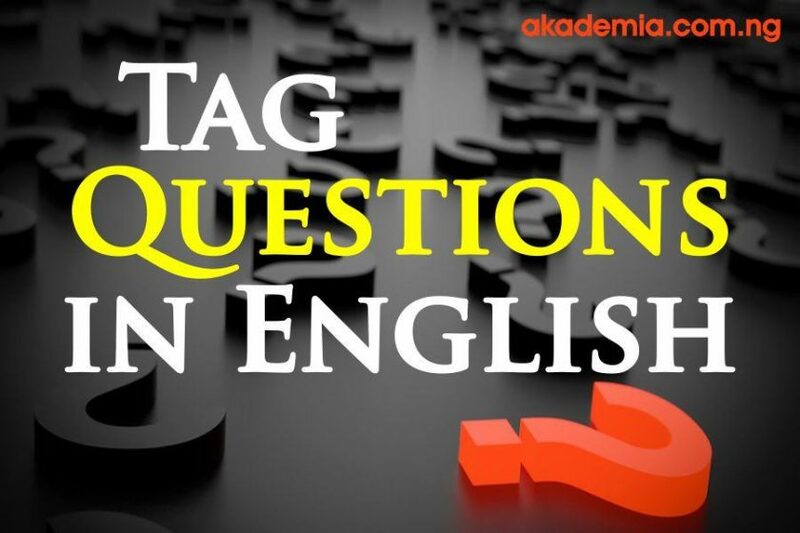 A tag question is a distinct structure in English. It is a statement followed by a mini-question. Tail question is also another name by which tag question goes. We use a tag question to turn a statement into a question. Now I have used question tag and tag question interchangeably because they actually mean the same thing. However, British English makes use of question tag while American English uses tag question. In further explaining tag question, we should note that we use it mostly in spoken form rather than in formal or written discourse. Tag questions can arise out of the need to be polite, or the need to elicit agreement or consensus, it could indicate emphasis or irony (humour based on using words to suggest the opposite of their literal meaning). Sometimes, it could come as a result of the need to hedge. A hedge is an evasive or non-committal statement. In addition, tag questions could even be rhetorical, (See Types of Questions). In the legal jurisdiction, lawyers or prosecutors use tag questions in their leading questions. We use tag question in confirming whether something is true or otherwise. We also use it to encourage a reply from our interlocutor. They are not here, are they? She is tired, isn’t she? He has bought a book, hasn’t he? We read his note, didn’t we? It is not clear, is it? They should not go there, should they? He has a car, doesn’t he? We will do our best, won’t we? I cannot drive, can I? She would do the right thing, wouldn’t she? He had long gone, hadn’t he? He is from London, isn’t he? John can speak Italian, can’t he? The apples aren’t good, are they? She shouldn’t behave like that, should she? You play the flute, don’t you? Aldan likes football, doesn’t he? The children went to the cinema, didn’t they? She studied Theatre in New York, didn’t she? Tom hardly ever speaks, does he? We rarely go out in winter, do we? He has not arrived, has he? The clients are not here yet, are they? We form the tag question from the statement using the subject and the operator; the syntactic formation is a subject-operator (S-op) inversion; that is inverting the subject and the auxiliary. In English, which has a broad range of tag questions, the choice of tag question depends on the grammatical form of the statement. She is not back, is she? You like soda, don’t you? Kids are not allowed, are they? I am doing the job. Ain’t is one of the most informal verb contractions in English, and its use in formal contexts may be criticized because it is associated with careless speech. It is, however, accepted in folk and popular song lyrics, show titles, direct quotations, and fictional dialogue. Otherwise ain’t is best avoided, except as a deliberate rhetorical device and in allusive expressions such as, You ain’t seen nothing yet. I am a teacher, aren’t I? I am doing the job, aren’t I? I am not a singer, am I? I am not travelling now, am I? As stated under the rules for question tags formation, we use the operator (the modal auxiliary verb or the non-modal auxiliary verb) to generate the tag question. If the operator is positive, the tag becomes negative; and if the operator is negative, the tag becomes positive. However, there are situations in which we do not use this normal pattern; positive statements attract positive tags and negative statements attract negative tags. There are even situations in which another auxiliary different from the one in the sentence is used to form the tag question. These are irregular question tags. Some refer to this as unbalanced question tags or same-way tag questions. Reasons for this could be for ironic, sarcastic or confrontational effects. We also use them to request confirmation or suggestion. Do pay attention, will you? Oh, I’m tired, am I? Statement: I refuse to attend the party uninvited! Response: Oh you do, do you? Let’s see about that! Oh! Making a decision, are we? I’ll cook some food, shall I? Let us pray, shall we? The driver has to come, doesn’t he? So you’re going abroad, are you? She wants to adopt a child, does she? So you think that’s funny, do you? They scarcely eat well these days, do they? I barely made it to the games, did I? She hardly lends out money, does she? It never happened again, did it? We seldom tell moonlight stories, do we? Don’t do it, will you? *Microsoft® Encarta® 2009. © 1993-2008 Microsoft Corporation. All rights reserved.